A user agent is the client application used with a particular network protocol; the phrase is most commonly used in reference to those which access the World Wide Web, but other systems such as SIP use the term user agent to refer to the user's phone. Web user agents range from web browsers and e-mail clients to search engine crawlers ("spiders"), as well as mobile phones, screen readers and braille browsers used by people with disabilities. When Internet users visit a web site, a text string is generally sent to identify the user agent to the server. This forms part of the HTTP request, prefixed with User-Agent: (case does not matter) and typically includes information such as the application name, version, host operating system, and language. Bots, such as web crawlers, often also include a URL and/or e-mail address so that the webmaster can contact the operator of the bot. If you are using Internet Explorer, Firefox or Safari, you can modify the user-agent string through add-ons or registry, it's very easy. Unfortunately, Google Chrome doesn't support externsions yet and the user-agent doesn't store in registry. You must directly modify the chrome.dll - open chrome.dll in a Hex editor, search Google Chrome User-agent string and then overwrite it. 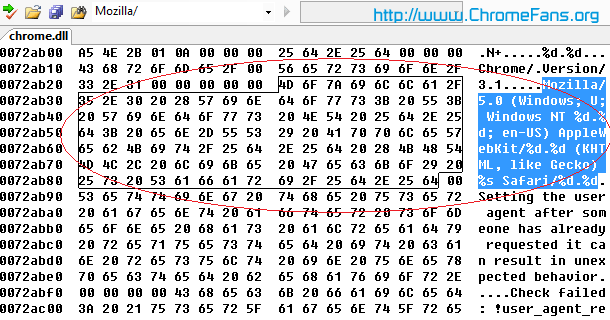 Launch a Hex editor program(Example: Abdio Hex Editor). I'm a VC++ developer so I launch Microsoft Visual Studio 2005. 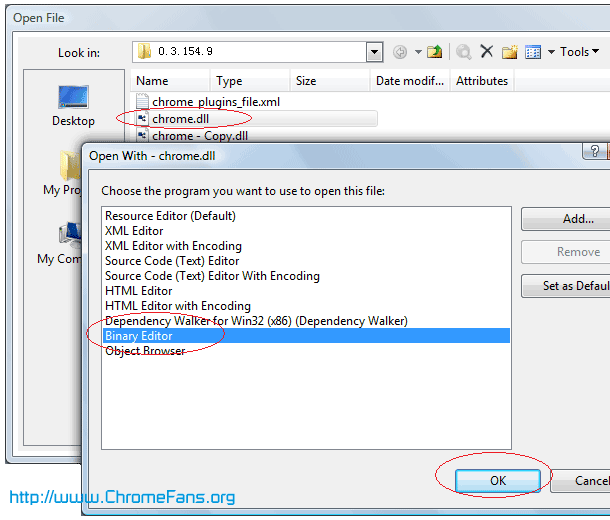 Please close Google Chrome if running, and then backup chrome.dll file in above folder. 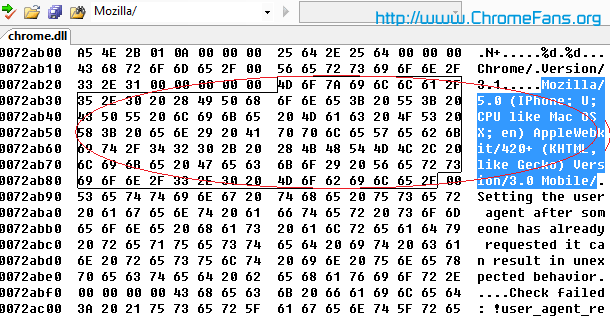 Open chrome.dll with binary mode. In Microsoft Visual Studio 2005, press Ctrl + O hotkey, choose chrome.dll, then click Open With button, choose Binary Editor on the dialog. Save chrome.dll, and then launch Google Chrome browser. If you start Google Chrome failed after saving changes, please restore chrome.dll from backup. Type about: in the address bar to confirm if the user-agent has changed. You can also visit http://www.HttpUserAgent.org, it will show your user-agent string online. Now, you can type http://imgs.zinio.com/iphone/ in the Google Chrome address bar and start access the popular magazines for free! Wikipedia.org - What is User-agent? There is NO NEED for all this!